(CNN) -- More than 1,300 Palestinians died and about 5,400 others were wounded during Israel's three-week offensive in Gaza, the Web site of the Palestinian Authority's Central Bureau of Statistics said Monday. 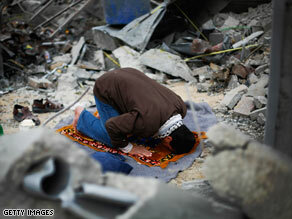 A Palestinian man Monday prays in the rubble of his home, destroyed during Israel's offensive in Gaza. Louay Shabana, head of the agency, said more than 22,000 buildings were damaged or destroyed. Shabana put the economic destruction at more than $1.9 billion. The fighting largely stopped Sunday with a cease-fire. Israel has said 13 of its citizens -- including 10 soldiers -- were killed during the offensive, which started December 27. Israel said its offensive was aimed at stopping Hamas militants from firing rockets into southern Israel. Gaza is in need of humanitarian, economic, sanitary and social help as a result of the Israeli attacks, Shabana said. Gaza's gross domestic product was slashed by 85 percent during the 22 days of war, and it could take a year for the economy to recover, the agency said in a preliminary report. In the field: Who won in Gaza? About 80 percent of crops in Gaza were destroyed, according to the agency. "The pervasive sense here among the population is one of overwhelming grief, so many families have been destroyed in so many ways," said John Ging, the top United Nations official in Gaza. Ging, UNRWA's Gaza director of operations, said the bill could reach "billions of dollars." Among the dead were 159 children, two of whom died in an UNRWA school that was shelled Saturday, Ging said. Gaza's main border crossings, which Israel often closed in response to Hamas rocket attacks, were open Monday. Infrastructure repairs were being made, but 400,000 people still had no water, according to Ging. Streets in some northern Gaza towns were flooded with sewage, and about 50 U.N. facilities were damaged, he said. More than 170 supply trucks crossed into Gaza on Monday, less than a third of the daily number that crossed in 2005, said John Holmes, U.N. under-secretary-general for humanitarian affairs and emergency relief coordinator. Israel tried to avoid civilian casualties in Gaza, a senior Israel Defense Forces officer said in a posting Monday on the IDF Web site. "This was not a war against the Palestinians," he said. "It was an operation of self-defense against Hamas and related terror organizations. Unfortunately, this task was made extremely difficult by Hamas, as they made the choice to use civilians as human shields." Israel began the offensive in response to rocket fire by Hamas militants after showing eight years of restraint, the officer said. The operation's goal, he said, "was to improve the security situation in southern Israel, and to facilitate peaceful living for the Israeli civilians living there." "We asked ourselves how to accomplish this, and the answer was to hit Hamas hard -- to strike the tunnels, the terrorists themselves, and all of their assets -- in order to prevent them from committing war crimes by firing rockets that target our civilian population," the officer said. He said seven rockets have been fired from Gaza into Israel since Sunday's cease-fire declaration. "We want to give this cease-fire a chance, but if Hamas chooses not to, we will utilize all of our means," he said.